Nelspruits Lowveld Botanical Garden is where I not only lose, but find my hat. Having dropped it somewhere on the pathways through their incredible African rainforest where my mesmerised self lost track of both time, and my hair covering. I was to have it restored to me by one of the entrance attendants who carefully placed it to one side to wait for my return visit, which obviously I was then destined to make. For those who know of the garden’s existence (because for a school holiday it was surprisingly empty), it’s a little piece of paradise in amongst the hum of the city. Fortunately, the presence of roaring waterfalls puts paid to any traffic noise and one easily ‘escapes’, as it were, into the beauty of the garden. The garden’s proximity to Tsoga seems to have paid off. They’re chiefly responsible for the incredible wooden walkways, visitors’ centre, restaurant, and indigenous plant nursery in the form of a generous sponsorship, together with grants from Environmental Affairs and Tourism. 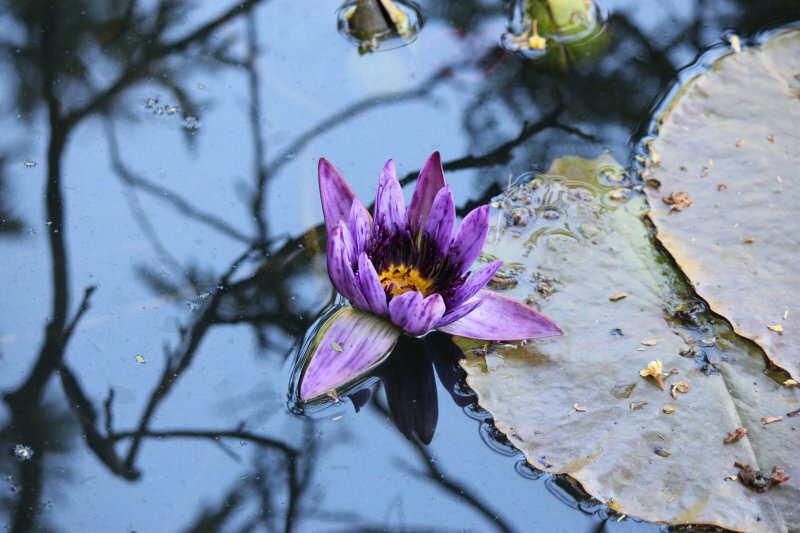 Now the Lowveld Botanical Society is looking for sponsors for a new children’s section in the garden in which they plan a theme garden, a maze and play areas, an outdoor classroom and artwork to decorate the space. The main entrance to the garden has been revamped since 2004. 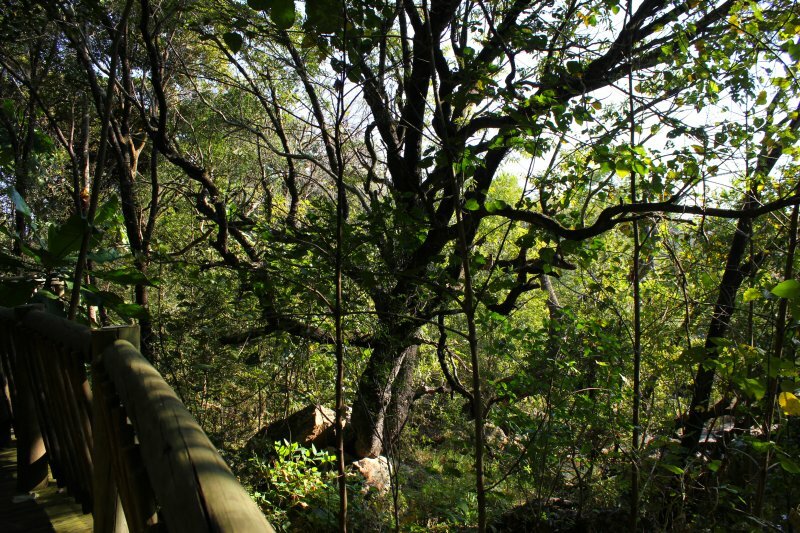 The Lowveld Botanical Garden is no longer the garden of people’s youth. A modern thatched entrance opens onto a totally unique water feature – the first of its kind in the world – made from verdite, the oldest known rock in the world that occurs in the hills of Mpumalanga. The water feature has been donated to the garden by Little Barn Craft. 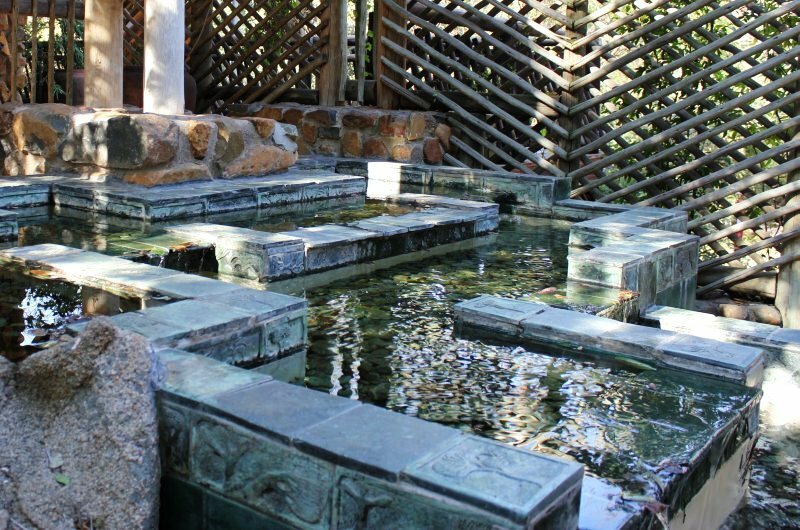 Each tile of the rock has been hand-cut and carved – it’s gorgeous. Little Barn Craft must be inundated with requests for similar – I know I’d love one. 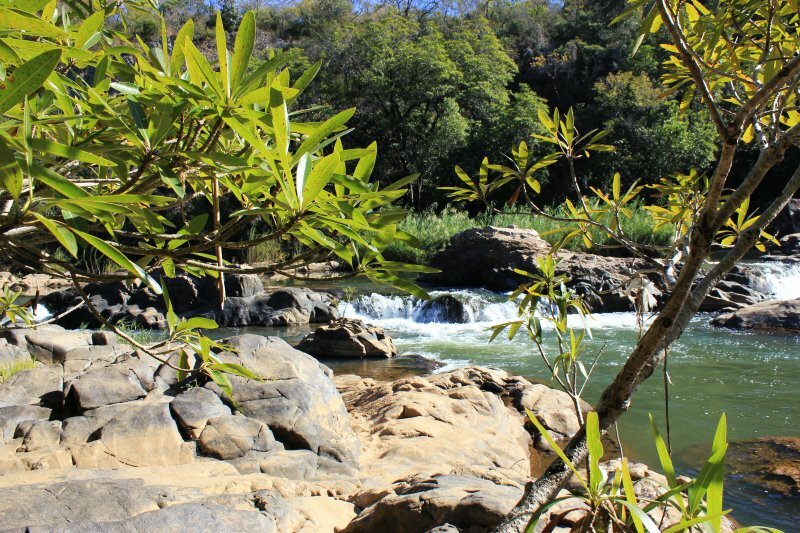 Beyond the entrance, where there is also a restaurant that serves incredible carrot cake, the Lowveld Botanical Garden is something of a surprise. I’d read all the literature, which had prepared me for the two rivers that run through the reserve (the Crocodile and Nels Rivers), the size of the garden (which had me visualising lots of green lawn), and the suggestion of steep slopes on the Crocodile River. I’d even read the bit about the rainforest, but nothing prepared me for the reality thereof. 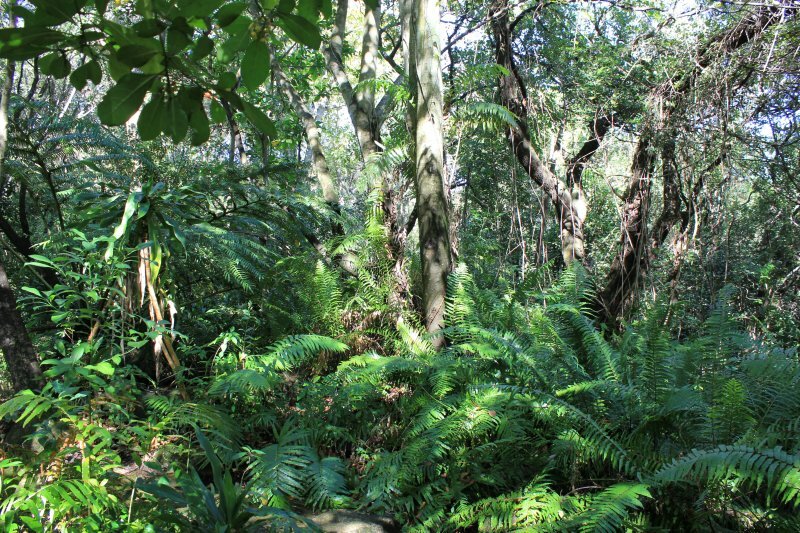 The simulated tropical African rainforest is an event in itself. Absolutely incredible, it graces the eastern bank of the Crocodile River, riddled with wooden walkways that allow one to walk in silence, in amongst the trees. Once a day, early in the morning, you might have to dodge a massive overhead stream of water that is the garden’s answer to the rain that should fall over the forest below. If anything, it adds to the novelty of the space. A rather impressive suspended metal bridge takes you across the Crocodile River away from the sweeping vistas of the waterfall – and the typical Lowveld type scenery that has one scouting around in amongst the krantz aloes in an attempt to sight the five-lined rainbow skink, often out sunning, but rather elusive nonetheless – to the rainforest. Suddenly one is transported into another world completely. The aerial boardwalk, sponsored by Sappi, allows one access to sights and sounds to which one is not usually privy. Looking upwards one can quite clearly see plants growing on plants, known as epiphytes, of which the rainforest is full. Tangled trees stand in amongst typical rainforest ferns, moss covered steps take over from the aerial boardwalk and lead you into little nooks and crannies where there are benches for minutes of contemplation, and burbling water in little ponds. The light in here in the late afternoons is indescribably beautiful and plays delightfully on the tips of large fronds and palms. The garden has cleverly simulated the forest by planting pioneer trees as quick-growers to provide the initial protective canopy, allowing the true forest to emerge underneath. Growing rapidly, once the big slow-growing emergent layer trees have grown, these pioneers naturally die. Below these layers are the understory layer, where little sunshine reaches and plants need larger leaves, and then the forest floor, where it is dark and damp and things decay fast, rich in bugs that make compost from fallen leaves and other debris in record time. It is sobering when standing in one to realise that rain forests are cleared at 40 hectares per minute. It take about 1000 years for them to re-colonise devastated area. And that coffee, chocolate, cola nuts and yams all grow in Africa’s rain forests. In fact, Africa is the home of coffee. Though more of it now grows in Brazil, coffee arabica bushes grow naturally in the forests north of here. From the forest one emerges into the rest of the garden, which looks more in keeping with the ‘garden’ that I initially had in mind – cycads, aloes, ponds filled with water lillies, and indigenous trees – like the sausage and candelabra tree. And there is a delightful Riverside Trail, which says it takes an hour to do, but which one can easily do faster. 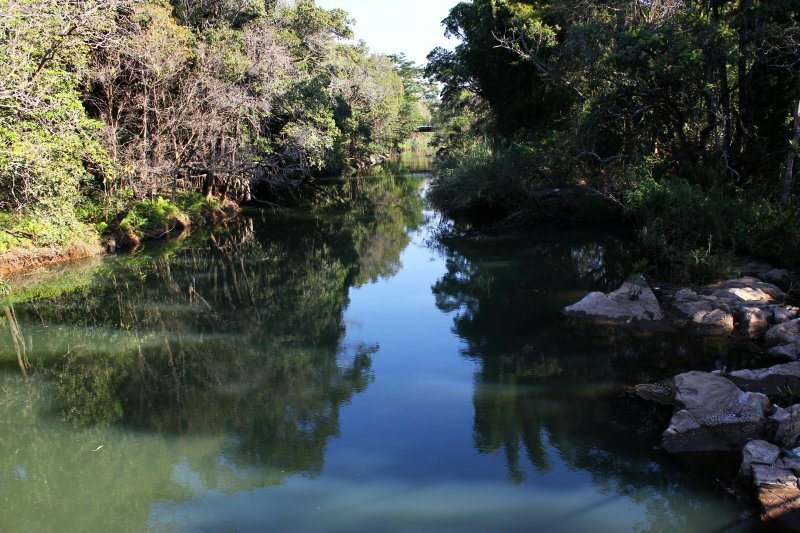 Winding through indigenous bush and riverine forest, the trail takes you along the banks of the Crocodile river, with many places to stop and simply drink in the view of water pools, flat rocks and little cascades, until you reach the falls of the Nels River at the far end of the garden. The threat of Bilharzia puts paid to any thought of water play for children, but nonetheless, it is a wonderful walk to do, and probably necessitates a second visit, for the forest will already have taken up a great deal of your time. And my hat. I return the following day alone, to collect it, obviously, but also for the chance to re-walk the boardwalks of the forest and to contemplate the destruction we wreak on rain forests elsewhere in the world. Once you’ve walked this forest you are left with only one question: can we afford to do so? Address: Off White River Road, Nelspruit, Mpumalanga.